Widening Participation manages a team of enthusiastic University of Canberra students for paid casual work as Aspirations Agents. Aspirations Agents assist the Widening Participation Team to deliver a range of programs to encourage students who are traditionally less likely to participate in higher education to view university as a valuable and attainable option. By working with a number of enthusiastic student Aspirations Agents, drawn from a variety of disciplines, backgrounds and a range of hometowns, our aim is to build networks and relationships with high school students in Canberra and the outlying regions in NSW. Aspirations Agents will work on our Outreach Programs to inspire high school students from disadvantaged backgrounds to aspire to higher education; however, you may also be invited to assist with a range of our programs throughout the year. Assisting to develop new programs and lessons. Aspirations Agents are students who easily identify with our target high school students, many of whom will be from rural areas or first-in-family to pursue tertiary studies. Aspirations Agents demonstrate excellent communication skills, a positive attitude, confidence in sharing their university experiences with others and the ability to build rapport with school-aged students. We value students who are reliable, proactive and outgoing. Other opportunities as they arise. 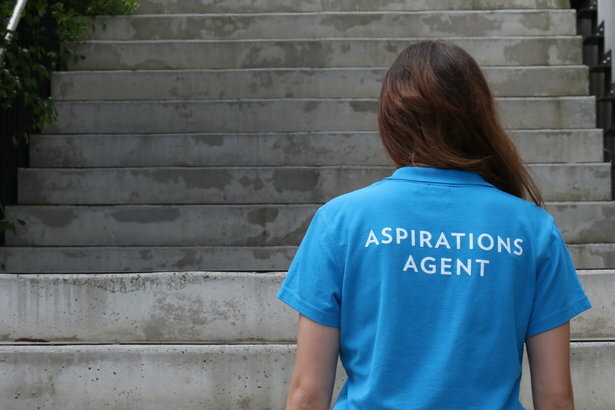 If you are interested in becoming an Aspiration Agent, please email aspireuc@canberra.edu.au to find out more. Studying: Double degree - Bachelor of Events and Tourism Management/Communications (Public Relations). Why UC? I wanted to study both Events and Tourism, and had an interest in Public Relations, I was fortunate that UC was the only university in NSW/ACT that offered the double degree, allowing me to do both at once. Being the first first person in my family to leave Dubbo to study, my parents were more nervous about university than me but are also proud of my efforts so far. What’s your dream job? My dream job is to manage music festivals such as Groovin The Moo and Splendour in the Grass. Studying: Double degree - Bachelor of Management/ Bachelor of Science in Psychology. I decided to study this degree as it gives me a lot of options to find what I would like to major in as well as many career opportunities it can offer me for life after study! What does studying mean to you? It means making my parents proud to be the first to take on the challenge of university, also makes me confident in myself. Why UC? Canberra is a bigger version of Wagga! Studying: I am studying Media Arts and Production and Majoring in International Studies. I chose this degree because I wanted to tell stories and put smiles on people’s faces across the world. What’s your dream job? Studying for me is a stepping stone to getting to my dream job as a Director. What does studying mean to you? I wanted to study Physiotherapy due to the exposure I had within this practice as a patient myself throughout high school. Why UC? The University of Canberra has become not only a place of study but a home to me. The students, staff and academics are passionate and welcoming and make the experience here at UC all the more enjoyable. What’s your dream job? My dream job is to be an awesome Physiotherapist and to travel the world helping others before one day opening my own practice. Studying: Bachelor of Communications in Advertising. After I finished high school I took a gap year, 6 months into my gap year I realised that I wasn’t ready to be working full time. I felt like I was wasting away the days when I could have been at university following my dreams. So, I applied for mid-year intake and 6 weeks later I packed my bags and headed to Canberra. I was ready to start loving what I was doing each day. Only problem, turns out architecture wasn’t what I expected it to be. I decided to drop my architecture unit and focus on my 3 electives and figure out my next move. A few weeks later I settled on Advertising and I haven’t looked back since. When I first dropped my degree I thought I had just wasted a lot of time and money following a dream I thought I had but if I didn’t take this path I wouldn’t have found my passion.